Perhaps it was the choppy ocean surf that brought some unusual items to shore on Wednesday. State park rangers closed the Delaware Seashore State Park to swimming after several surfers reported finding some IV needles just south of Dewey near Tower Road around 3 p.m.
Also washed ashore on the beach near Tower Road were a variety of debris, skate egg casings, plenty of old balloons, plastic containers and bottles, plastic tampon casings, decayed sea vegetation, and even this color Zenith TV/VCR combo. 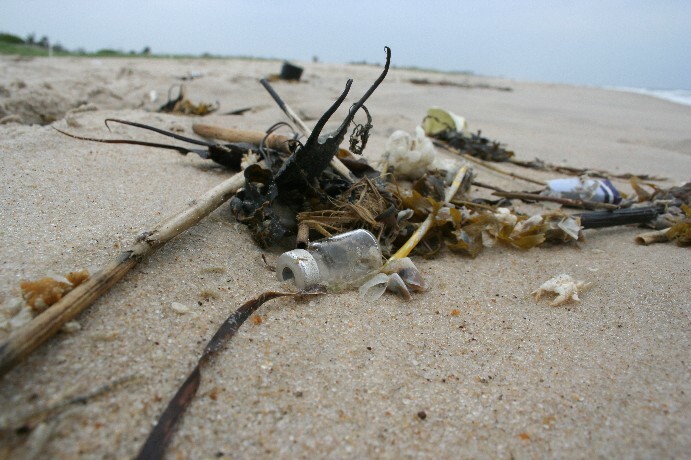 Michael Bott of DNREC's Shellfish and Recreational Water Programs says "there was a temporary beach closure which lasted from 3:30 p.m. until 5:00 p.m. to investigate the presence of medical debris which had washed up on the beach [in the Delaware Seashore State Park on Wednesday]." Bott says the agency responded to the report and initiated an investigation to determine if there were any health risks posed by the debris. He said an investigator determined that the debris was old material which had been "re-suspended from the ocean bottom and did not pose a public health threat." The beach was reopened 90 minutes after it was closed because no health threat was discovered, he said. The Division of Parks and Recreation is continuing the investigation and is asking visitors to report anything out of the ordinary by calling 1-800-662-8802. Bott added that "If the closing would have been anything more than a temporary investigation it would have been recorded on the Beach Hotline [1-800-922-WAVE] to notify the public." While DNREC was conducting this investigation, a military flare casing was reported on Stockley Street in Rehoboth Beach around 3:45 p.m. Beach patrol staff reporting the find to police said it was labeled "Do not touch, contains phosphorous, could create burns, and notify police or military if found." After consultation with a state police bomb expert, they decided it was an expended military flare, and the state police would retrieve it from Rehoboth Beach police at a later date. 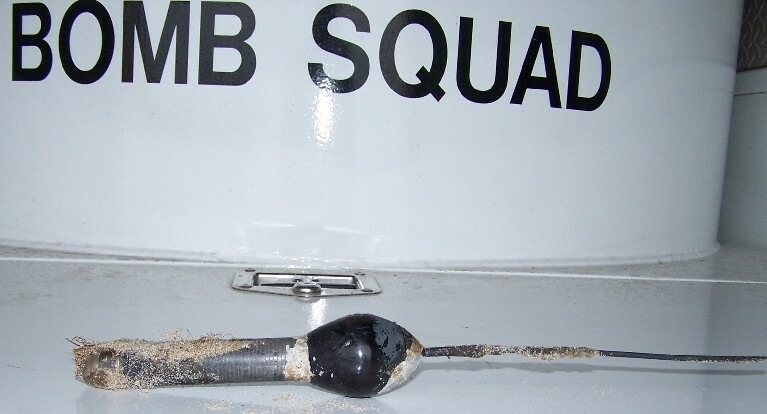 In Ocean City that same day, the city's bomb squad investigated a mysterious object discovered in the surf at 32nd Street. Beach Patrol Capt. Butch Arbin said it was a fish-tracker, but "looked very strange." After cleaning it off, the device had a phone number painted on the side which appears to belong to the Hudson River Inland Fisheries section of the New York State Dept. of Environmental Conservation (DEC). We were unable to reach any DEC representatives by phone or e-mail during the weekend. 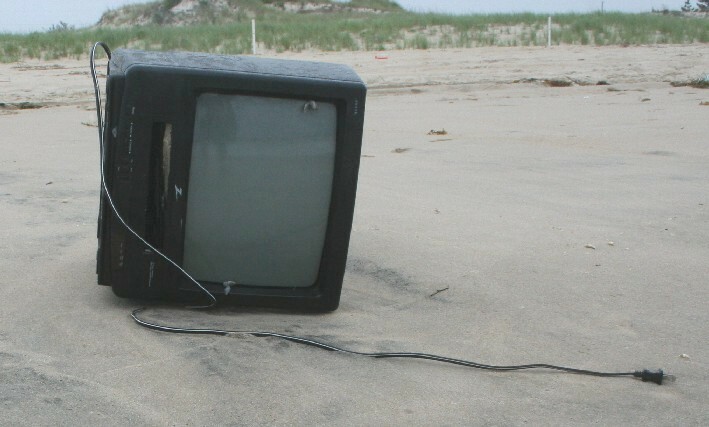 But Ocean City's investigation determined it is a fish finder. Georgetown firefighters and a flatbed tow truck helped remove this Dewey Beach police car from a storm water pond Saturday evening. The officer crawled out of the window and over the pond using a fire department ladder. She declined transport to a hospital. 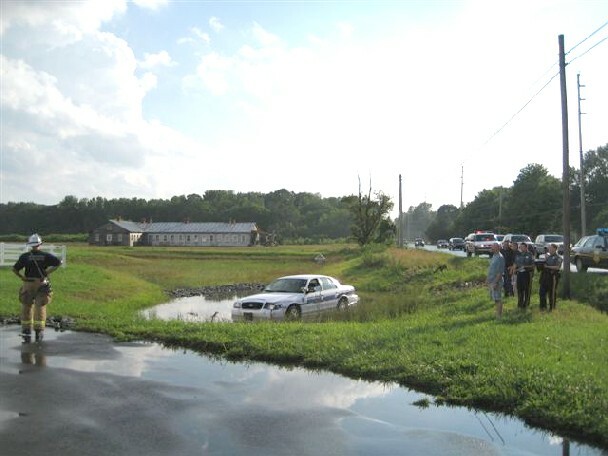 The incident happened around 6:15 p.m. on Lewes-Georgetown Highway (U.S. Rt. 9) at Park Avenue (Truck U.S. Rt. 9) east of Georgetown. The Delaware State Police says in this news release issued Sunday evening that the driver of the police car was cited with careless driving. And the month is not over! According to the Boardwalk Plaza's WeatherBug's site, Saturday's downpour brought a half inch of rain to Rehoboth Beach. 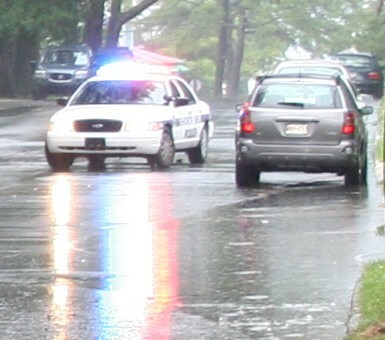 This is what it looked like on Rehoboth Avenue at Second Street. This past week the weather has been unpredictable, with sunshine one moment, followed by rain and sun with rain. 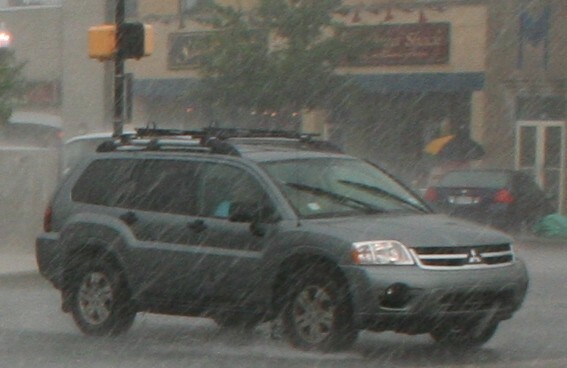 Some flooding was reported in several areas between Rehoboth and Ocean City. 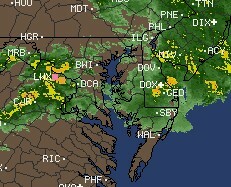 Here's the RADAR view for 11 a.m. Saturday from intellicast.com. Earlier in the week, Rehoboth Beach police blocked the second block of Norfolk Street briefly when storm drains were overwhelmed and blocked by debris. Water flowed into several yards. Wednesday was a bitter-sweet day for Sussex County EMS. The day marked the one-year anniversary of the death of Stephanie Callaway, the first line-of-duty loss in Sussex County EMS’s nearly 20-year history. The dedication of the new paramedic station in her honor also celebrated accomplishment. The EMS agency made tremendous strides in almost 20 years, expanding its fleet of emergency vehicles and stations, attracting top-notch paramedics and serving as a model to other communities. Some critics said it was not going to be practical to cover such a large rural county and make a difference. But committed professionals, like Callaway, proved them wrong. 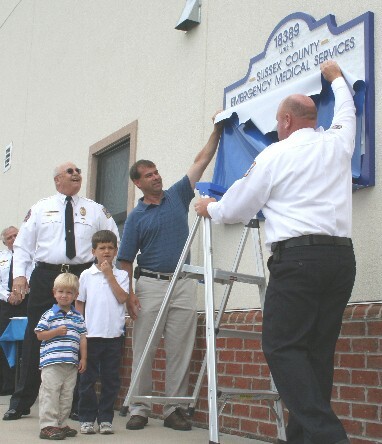 One of the most touching moments was when Callaway's husband and two children helped unveil the station's sign which carries her name (above). In addition to her family, friends and coworkers, more than 100 people attended the dedication, from all different professions. 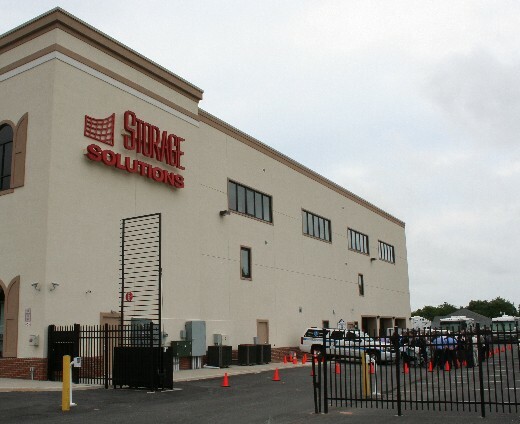 The Stephanie L. Callaway Memorial Station is built into the Storage Solutions building, which is south of the Midway Shopping Center, between Lewes and Rehoboth. The three vehicle bays house the area's primary EMS response truck (Medic 104), the Eastern District EMS supervisor vehicle (EMS 100), and a spare/power-shift vehicle (Medic 109). It is the fourth facility to house Medic 104. Love Seed Mama Jump, a local six-piece rock band, performed before an enthusiastic crowd Friday evening. 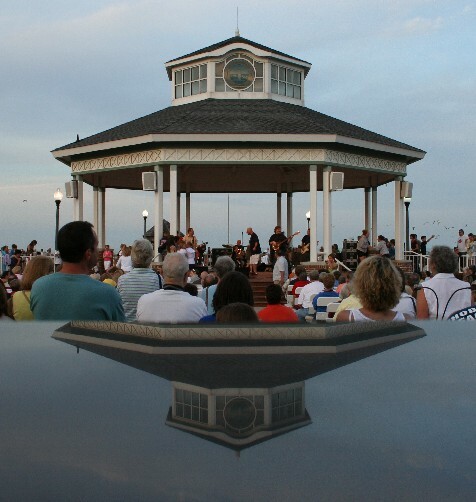 This was the Rehoboth Beach Bandstand's official opening for 2009. The bandstand's schedule is posted online. .........HEATED DISCUSSION WITH TICKET WRITER ABOUT REINO METER, PRICELESS! 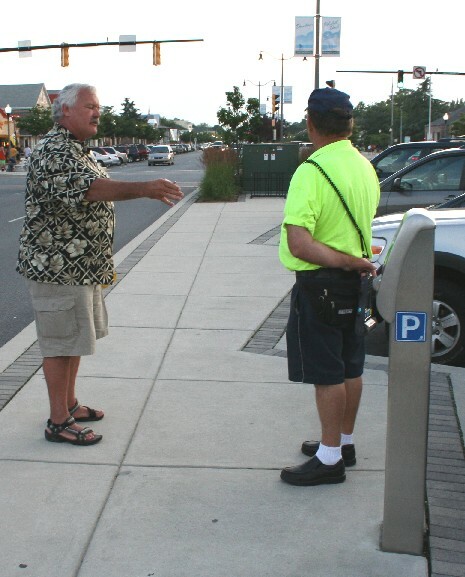 The frustrated visitor talks with a Rehoboth Beach ticket writer around 8 p.m. Friday evening. He claimed several people watched him pay for his parking. He said he used a credit card to pay for the maximum allowed at the meter, three hours for $4.5. But he received a $30 municipal parking summons. He wasn't happy. 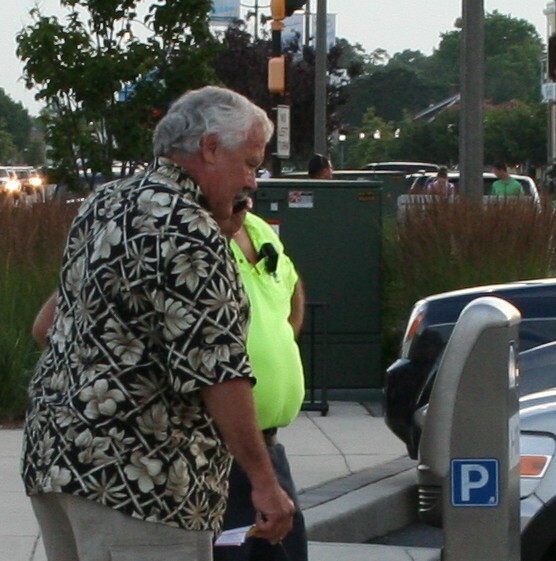 The ticket writer walked him to the Parking Meter office to further discuss his complaint. Joe "Cat Man" Mosser is well known for his care of the homeless (and semi-homeless) cats. Joe has no car. So the 84-year-old walks from downtown Rehoboth Beach to the Food Lion once a week (or every other week) just to purchase cat food. That's more than a five-mile round trip. Here he is on Friday returning to town with his dolly. News leads and photos are appreciated! Please e-mail alan@henney.com or call 302-227-9160. Also try AOL or Yahoo instant-messengers or Facebook, Twitter, MySpace (all screen names: AlanHenney). Listen for the “Henney Report” on 92.7/WGMD-FM’s Monday morning show with Dan Gaffney!